With its antique charms, vintage knick-knacks and comfortable couches, I'm surprised more people haven't discovered Bee's Knees Café; perhaps because it is tucked away behind Hornsby Inn on the "old side" of Hornsby. The cosy vintage shop/café hybrid is packed with lamps, scrabble board games, old books, jewellery and vintage garments – and that's just to name a few. 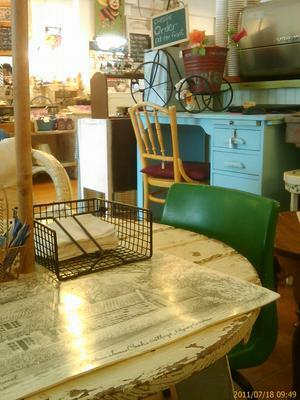 Cabinets are full of antique knick-knacks and the walls busy with trees, butterflies, flowers and other cheerful prints – it's all a little overbearing upon first glance, yet the café's quirky interior has a charming appeal that keeps me and my mates coming back. Everything you lay your eyes on is for sale – whether it be the cute vintage cushions you settle into, or the homely white cane table you lay your coffee onto. Apart from the main café, there is also a cosy back room and a cluttered courtyard, also – you guessed it – decked with interesting vintage pieces. Enough about the vintage items – what about the food? Bee's Knees has a whole range of baked goodies on offer – slices, cookies, scones, banana bread, friands, toast and waffles. My favourite would have to be the scones, which come with butter, jam and cream! A decent assortment of coffee and tea is available, including a range of chai lattes, with spiced and chocolate flavours. The café is also suitable for lunch, with sandwiches, pies, salad and quiche available. 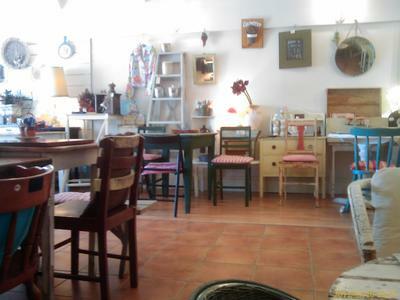 Bee's Knees Café is a great place to meet friends for a coffee or meal – with a warm, welcoming atmosphere, personable staff and funky furniture for sale, it really is a pleasant spot to stumble across when in need to relax and recharge at the end of a chaotic week. Word of advice though - you should probably bear in mind the risk that afternoon tea could easily turn into a shopping spree. Where: 14 Coronation Street, Hornsby. I've heard really good things about this place and have been meaning to go there for a very long time, looks very cute inside. A regular quiet relaxing space for me in Hornsby- so eclectic, so seren, so my type of space.The hot chocolates amazing! Love this cool little place although the menu is very limited so my wife refuses to go there anymore! They need more options that don't contain bread as the main component.